According to a new report from Futuresource Consulting, strong demand in the corporate and education sectors has propelled sales of wireless presentation solutions (WPS) to an all-time high, but significant challenges remain for brands in this space. 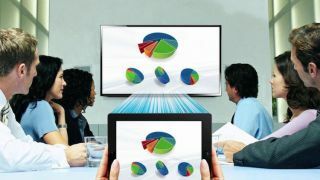 The Wireless Presentation Solutions Global Market Report reveals that sales of WPS, which is a segment of the rapidly evolving meeting and classroom collaboration market, grew 35 percent from 2016 to 2017, accounting for greater than $480 million in revenues, with further growth forecast in the short to medium term. "The opportunities available in this space are vast," said Anthony Brennan, research analyst at Futuresource Consulting. "There is growing demand in corporate and education markets for increased content sharing from a range of mobile devices to a main display. However, evolving end-user demands and the entrance of vendors from a wide range of backgrounds pose a significant threat to established WPS hardware companies." Although the dedicated WPS hardware segment, led by Barco ClickShare, is predicted to grow throughout the forecast period, with a 2017-2022 CAGR of 16 percent, ASPs are forecast to decline, as the market shifts to entry-level solutions and competition intensifies. WPS vendors face a growing threat from an array of product categories, which are integrating wireless screen sharing as a secondary feature. In addition, the longer-term adoption of software-based solutions is expected to affect sales of proprietary hardware as the market matures. Futuresource forecasts that competition across product categories will escalate moving forward, bringing new vendors to the segment and posing a unique threat to the makeup of the market. Despite this, the outlook for dedicated WPS hardware solutions remains healthy in the short to mid-term, with demand for sharing content from multiple devices in meeting and classrooms growing. This is particularly evident in Western Europe and North America, where volumes are most concentrated. China presents an anomaly in the worldwide market, with the country dominated by domestic players and international brands struggling to gain a foothold. The role of low-cost solutions coming from China adds even more pressure to this rapidly changing market. This report sizes and profiles the global WPS category, providing detailed market sizing, brand share analysis, and forecasting for hardware-based commercial grade wireless presentation solutions in B2B markets. The report also forecasts market growth of competing technologies and discusses the developments in software-based WPS and trends in the integration of wireless presentation capabilities as a feature into other meeting and classroom hardware. In addition, the report offers an overview of the competitive landscape providing key vendor profiling and shipment information. To view all of Futuresource’s latest reports, please visit its reports portal here.